TOURS -1st Wed. of the Month, attend the marketing meeting and will be put on a list. 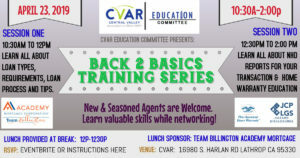 This New Training Series is for CVAR MEMBERS ONLY. New and Seasoned REALTORS are welcome. Go to www.cvar.org Click on Member Login. CVAR members need to login with your NRDS #. Click on Register for Events. 8:30-8:45 Networking / Meeting is 8:45-9:45 am.